Helloooooo all my lovely readers out there! Continuing the review of my Black Friday purchases I’m going to be bringing you some new to me brands, one of those is Different Dimensions. Now, I have been eyeing up the polishes in the Different Dimensions shop for what feels like months but I hadn’t ever taken the leap. So, I’m really excited to show you what I scored in one of her flash sales over the major shopping weekend! Just looking at the pictures makes me happy! I’ve actually worn this again since I swatched it (shocker!) because I love it so so much. Money is a white crelly base filled to the brim with so much glittery goodness I don’t know if I’ll be able to identify it all but I’ll try! I see small and medium matte neon lime green hexes, small metallic teal dots, OMG big metallic teal dots, OMG big matte black dots, small holographic gold and lime green glitters, OMG big holographic white?silver? dots (it’s hard to tell the color of these because the holographic effect is so rainbowy (just go along with me making up words because it’s not gonna stop!) that it’s hard to see what the actual color of the glitter is! BOOM another shot of that gorgeousness! Application was actually quite good. I didn’t have to fish for the larger glitters though I did manipulate them a little bit once they were on the nail so that they weren’t clumped together as big glitters are wont to do at times. I expect to have to work a little harder with crelly-based (and jelly-based) glitter polishes and to me it’s worth it but it does take a little getting used to – I generally start with a thin coat and I don’t worry about getting the larger glitters on at that point, just whatever gets on the nail is good, then after letting that dry a little bit I do the second coat which is usually a slightly thicker coat and sometimes I dab the glitters where I want them. The first coat with whatever glitter got on the nail the first time helps grab the glitters in the second coat and hold them there. 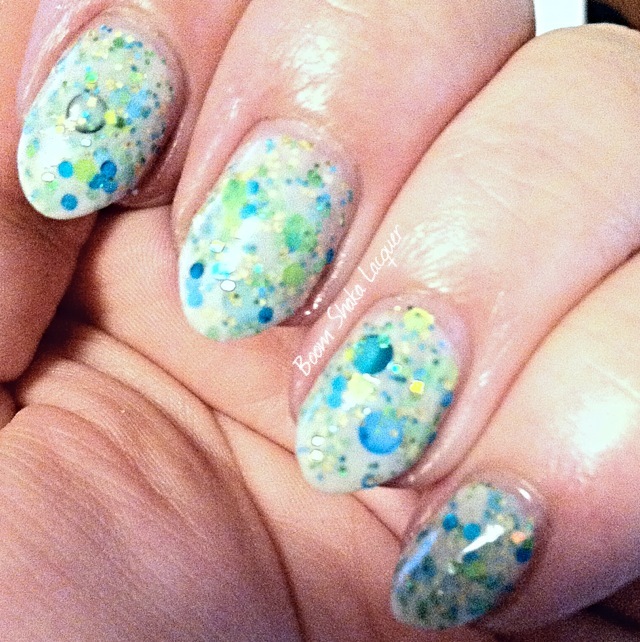 Picture shows two coats plus Glitter Food and HK Girl topcoat. 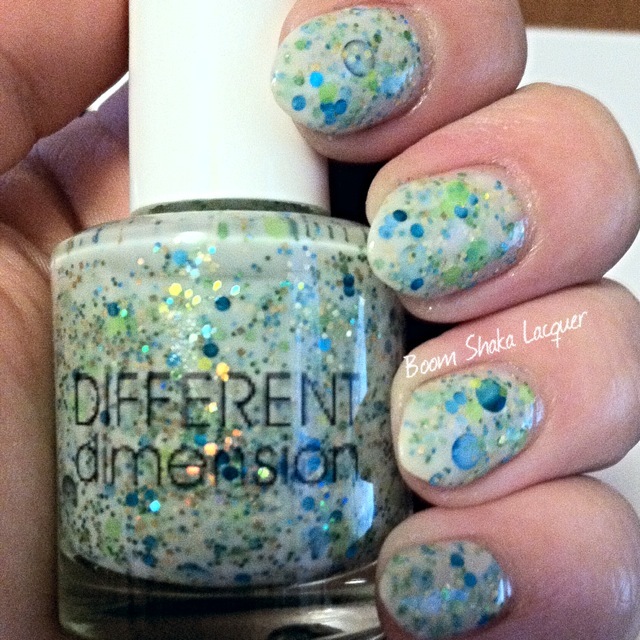 I highly recommend this polish and I can’t wait to try some more Different Dimension polishes! You can keep up to date on all the happenings over at Different Dimension by following them on Facebook and Instagram and you can buy your OWN bottle of Money because as per usual this one is MINE at her Etsy Shop! This entry was posted on January 11, 2014, in Different Dimension, Indie Polish.